Baileys is opening a pop-up bar to celebrate their sponsorship of the Baileys Women’s Prize for Fiction. It's going to be at the new Waterstones store at the bottom end of Tottenham Court Road, from Monday 16th to Sunday 22nd May, and there are lots of evening events planned for that week - full list here. In addition, if you buy one of the six shortlisted books, you'll get a free Baileys cocktails to enjoy in the bar. Nice one! "On Monday 16th May, the Baileys Women’s Prize for Fiction will open its first-ever pop-up Baileys Prize Book Bar at Waterstones’ new Tottenham Court Road store to celebrate the best writing by women and the 2016 Baileys Women's Prize for Fiction shortlist. 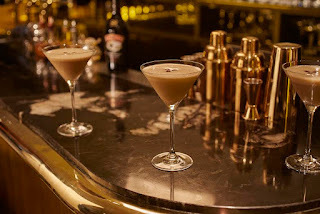 The collaboration will see the basement bar transformed into an inspiring oasis which combines the love of reading with the pleasure of a Baileys. For five days only, book lovers will have the chance to drop into the Baileys Prize Book Bar during the day to relax, to celebrate the six fabulous novels that make up the 2016 shortlist whilst enjoying a Baileys. Book clubs and reading groups will be invited to host sessions in this inspiring new venue in the heart of London. The 2016 shortlist is Ruby by Cynthia Bond, The Green Road by Anne Enright, The Glorious Heresies by Lisa McInerney, The Portable Veblen by Elizabeth McKenzie, The Improbability of Love by Hannah Rothschild and A Little Life by Hanya Yanagihara. On Wednesday and Friday lunchtimes, there will be an opportunity to hear each of the six novels brought to life in exclusive readings from actors Tori Allen-Martin and Jim Rastall. Come cocktail hour, the bar will transform into a hub for enthralling readings, discussions and stimulating panel events with some of the UK’s most inspirational women – not to mention creative cocktail making, and an exclusive DJ set. Readers who purchase one of the six shortlisted books throughout the week will receive either a free Flat White martini or a Baileys coffee to indulge in as they celebrate the brilliant novels selected by the judges for the 2016 Baileys Prize"